Oh, KBShimmer. You've gone and done it again ... you've stolen my heart with yet another amazing nail polish color that's unlike any other. Welcome to my life, KBShimmer I Wet My Plants. First of all, can we talk about the fact that this name is SO MUCH FUN? I had to buy it based on the name alone, because it just made me giggle. But then, once the name hooked me, the color itself gave me ALL. THE. FEELS. Absolutely loving the addition of pink and purple glitters here. 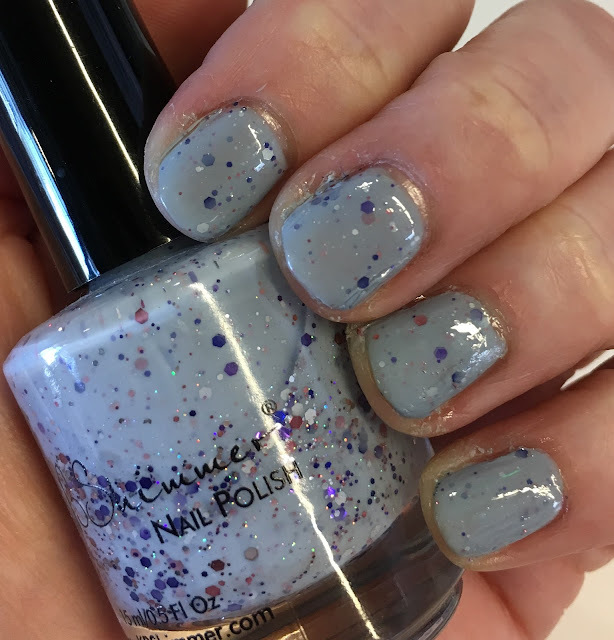 KBShimmer I Wet My Plants is a pastel periwinkle crelly from the Spring 2016 collection. It's based on the Pantone 2016 Spring/Summer shade, Serenity, which is a delightful shade of periwinkle. But, in true KBShimmer form, it's completely and totally unique! I always love the multiple levels of glitter and sparkle layered into KBShimmer shades, and with pink, sapphire, silver and purple multidimensional glitters, this one is no exception. I used two coats, which helped to lend depth to the shade. I love how the glitter builds upon itself and creates a sandwich-like effect. I also love that, like the other KBShimmer colors I've tried, a lot --and I mean a LOT -- of glitter comes out of the bottle with each sweep of the brush. 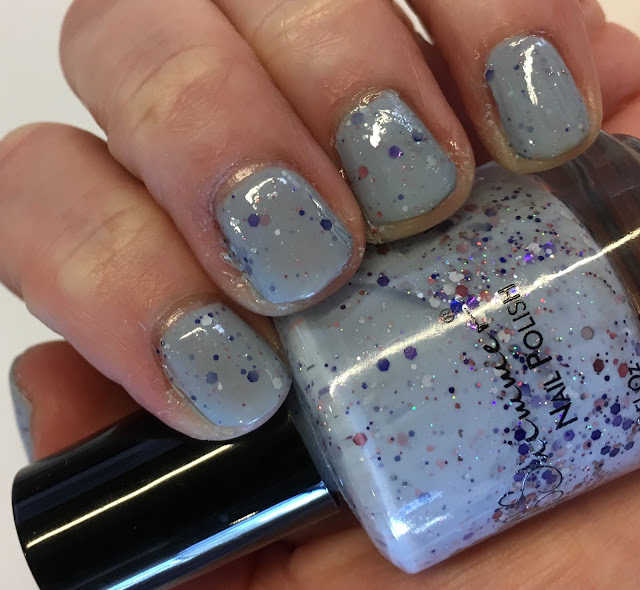 Unlike some other scattered glitter polishes I've tried, you don't have to work very hard to get the glitter out of the bottle, even in only one coat! Each of my nails has a fun mix of glitters that is different from all the others. Another look at KBShimmer I Wet My Plants. Hello, fabulous. This is definitely a shade I just can't help but love. I've been staring at my nails all morning! KBShimmer I Wet My Plants retails for $9.25 at kbshimmer.com. I love KB Shimmer's glitter crellies. The formula is impeccable and this colour is amaze. The name is absolutely hysterical! 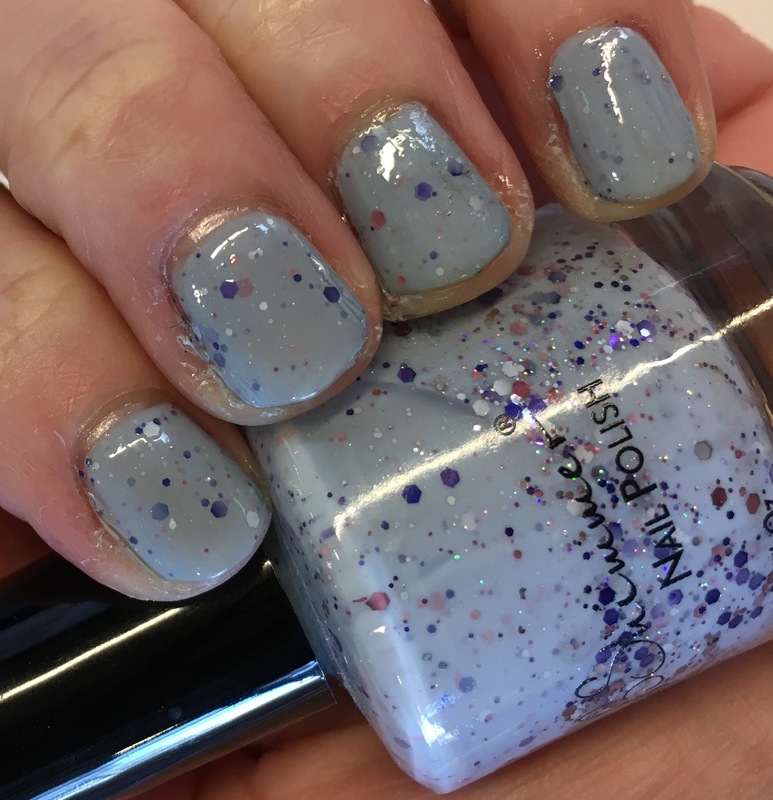 I love the color of this polish, and it looks great on you! To be honest i have no polish on my nails except on my left pinky a small bottom stroke of pink polish from SpaRitual called Dreamsicle. About the shade that you have on your nails: I like it it reminds me of the milky way from another brand a few years ago. Ooh, I love this! I need more KBShimmer in my collection. What a great name. KBShimmer wears so beautifully on me. I wore an OPI shade last week and it was a disaster. With KBShimmer I can go almost two weeks. KBS always has such cute shades, this one is lovely! The shade is pretty, but that name of it has me laughing out loud!! This is adorable! Reminds me of cement with confetti in it. KB Shimmer seriously does no wrong! I love these fun polishes by KB Shimmer!